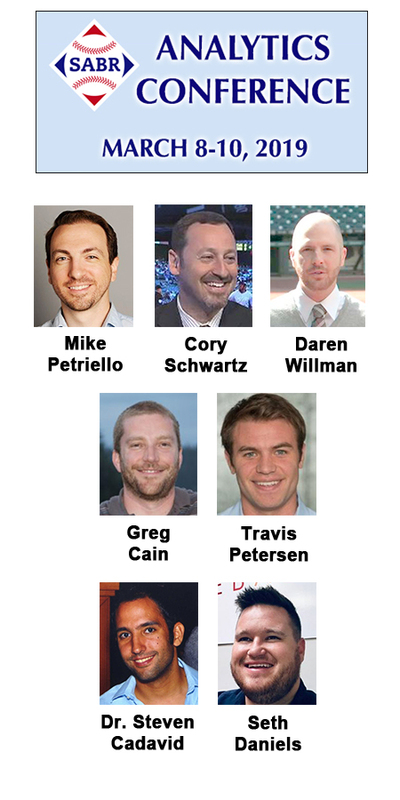 We are pleased to announce more of our featured speakers and panelists at the eighth annual SABR Analytics Conference, presented by MLB and KinaTrax, in Phoenix, Arizona. The SABR Analytics Conference will be held Friday, March 8 to Sunday, March 10, 2019, at the Hyatt Regency Phoenix. The conference is open to all baseball fans — regular registration discounts are available online only through February 14. Click here to register! They will join our other featured speakers, who are expected to include: John Dewan, owner of Baseball Info Solutions; Mike Ferrin, Arizona Diamondbacks and SiriusXM MLB Network Radio broadcaster; Vince Gennaro, SABR President; Rob Neyer, author of Power Ball: Anatomy of a Modern Baseball Game and host of the new weekly podcast, SABRcast with Rob Neyer; Carlos Peña, MLB Network analyst and former All-Star first baseman; Eno Sarris, staff writer for The Athletic; Jason Benetti, Chicago White Sox broadcaster; Steve Berthiaume, Arizona Diamondbacks broadcaster; Kyle Boddy, founder and owner of Driveline Baseball; Eduardo Perez, ESPN baseball analyst and former major-league player; Dr. Lee Picariello, owner and operator of Mindful Athlete Training; and more. Click here to learn more about our speakers and panelists. Please note: All speakers are subject to change depending on availability. In its first seven years, the SABR Analytics Conference has brought together many of the top minds of the baseball analytic community under one roof to discuss, debate, and share insightful ways to analyze and examine the great game of baseball. Stay tuned as we announce more featured speakers and panelists at the 2019 SABR Analytics Conference! For more information, visit SABR.org/analytics. This page was last updated February 4, 2019 at 1:06 pm MST.